Throughout his weightlifting career, Sri Chinmoy had always tried to improve the strength of his wrists and forearms by doing wrist curls and wrist flexes. He liked to do these at home, seated in a chair with the dumbbell resting on his knee. It was a staple of his regular morning workout, and he would work his right and left wrists equally. Many experts had commented over the years that Sri Chinmoy’s wrists and forearms must have been extraordinarily strong to handle so much weight day after day. 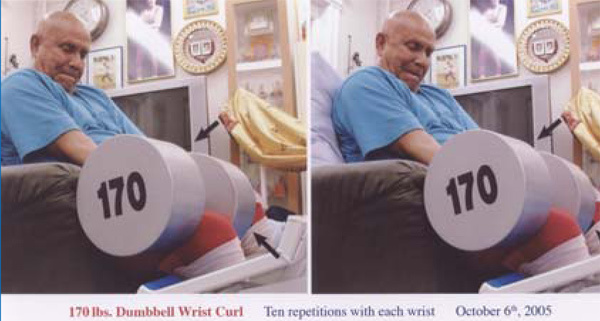 In 2005, Sri Chinmoy became inspired to push his wrists to the limit. During his birthday celebration that year, he did a seated dumbbell wrist curl of 100 pounds 10 times with each hand. Just five months later, on January 30th, 2006 while visiting Malaysia, he set his personal record when he curled 270 pounds 30 times with each wrist. The dumbbell was so massive that two men had to use a specially constructed rolling lift to move and lower it onto Sri Chinmoy’s knees. He dedicated the lift to all the men and women of his age – 74 years young!